Bella is a lucky dog. Although hurt in a hit and run incident, she had Mike Tolley, Owner of Uncle Mike’s Smokehouse and his wife, Simone, as her guardian angels. Mike drove around the area and was about to give up when he finally spotted the body. He got his flashlight and stepped into the grass, and to his surprise the dog lifted her head, her eyes tearing but without a sound. He rushed her to the all-night vet. Bella’s plight was posted on a Facebook page which went viral with over 90,000 visual impressions. Offers to assist were received, including the Brethren of St. Francis Animal Rescue, who is supervising care of Bella and helping to fund her necessary expenses. 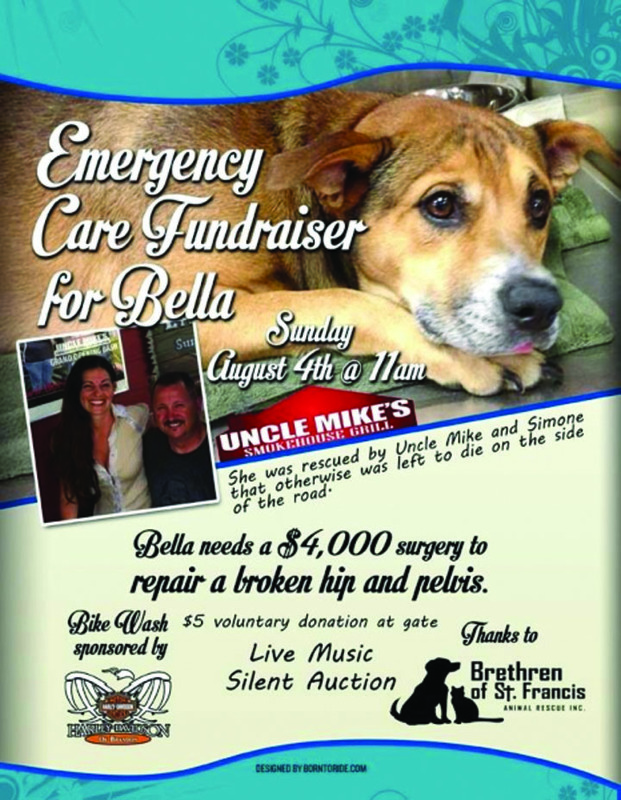 Bella needs surgery which will cost $4,000, and Mike and Simone, along with the Brethren of St. Francis, will hold an Emergency Care Fundraiser at Uncle Mike’s Smokehouse Grill at Brandon Harley, located at 9847 E Adamo Dr, in Tampa on Sunday, August 4 starting at 11 a.m.
To raise the necessary funds, friends of Uncle Mike have offered their services of free musical entertainment. A voluntary donation of $5 will be asked at the gate and a 50/50, silent auction items, and a Bike Wash, sponsored by Brandon Harley-Davidson, will be the means for raising the necessary funds for Bella’s surgery. All are invited and encouraged to attend and this is a pet-friendly event, so your pets are welcome to join the festivities. Anyone interesting in donating can contact Blue Pearl Veterinary Partners, Brandon at 571-3303 and reference “Bella of The Brethren of St Francis” or visit https://www.wepay.com/donations/bella_2 to make a donation online.